Mailigen is best for small to medium-sized e-commerce businesses looking for a tool that’s easy to pick up but also includes reasonable depth. Mailigen has one of the easiest UIs we’ve come across. Excluding its reporting features, users can instantly tell where everything lives (they scatter ad hoc reporting across each individual feature). It’s ideal for both new and experienced email marketers alike. The drag-and-drop editor is very friendly, and it offers 100+ templates for all types of businesses and events. The dynamic content feature is great when combined with the subscriber segmentation system. By changing the content that subscribers see depending on their past behavior or list membership, marketing efforts can be personalized to a high degree. Also, Mailigen’s live feed feature provides live subscriber behavior updates, which can be great for email marketers trying to reach a small but influential audience. Users can respond to lead’s actions with context and timing via this feature. Apart from the UI being extremely useful, Mailigen holds ease of use in high regard. It clearly makes an effort to make it as easy as possible for anyone to use the platform, and its devotion to this mission shows. From the get-go, users are greeted with a video from the CEO/Founder discussing how to best take advantage of the platform, and are assisted by more employees as they are walked through the official onboarding process. The videos are well-produced, and can always be skipped for those who are more of a “learn as you go” type. For businesses seeking more of an email marketing partner, it is one of the few services we’ve seen that offers dedicated campaign management service, free custom email design service, email marketing audits and a dedicated account manager. These features aren’t cheap (starting at ~$499 per month), but for those looking to find someone to take the time to train and assist them every step of the way as a consultant, this option could be useful. Mailigen has an impressive set of templates. 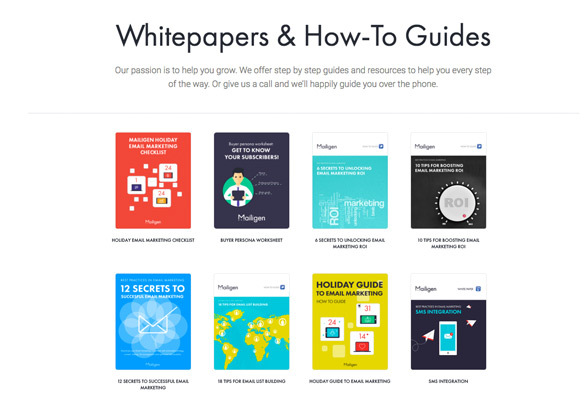 There are over 100 templates covering everything from e-commerce to education. It has virtually all potential businesses covered, and the tool makes it simple to customize as needed. All of the templates are mobile-responsive, and users will find it easy to make them look how they want with nine content blocks, four column layouts, social integrations and even static video embeds. Similar to Mailchimp, Mailigen offers a credit-based option and a recurring monthly option for whatever the use case may be. 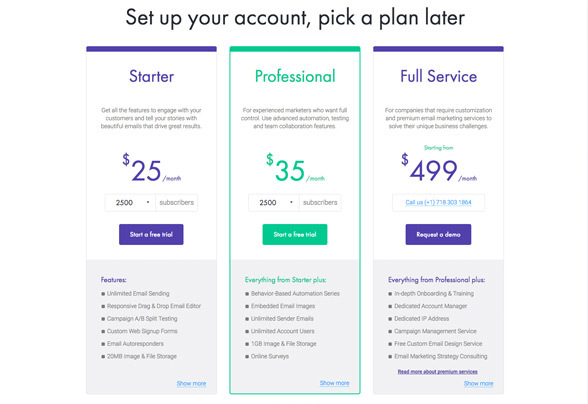 Its lowest plan that includes all of the core features is the Professional plan at $35 a month for 2,500 subscribers (20 percent annual-pay discount), which is a very good deal considering all of the features. Scaling increases that rate at an appropriate amount — Mailigen never charges more than $25 a month for 2,500 additional contacts, and it’s willing to negotiate at Enterprise levels. The credit plans start at 1.6 cents per email (2,500 emails for $40 dollars) and drop to 0.4 cents per email at packages of 100,000 ($400). Users are allowed to drop their contract at any time — they just finish the month out and they can be on their way. Mailigen is extremely friendly to new users. It doesn’t take long at all to learn the majority of its features, and any questions can be answered quickly and easily by its videos or staff. The depth is there when needed, but it doesn’t get in the way of performing simpler tasks, such as monthly newsletters or A/B testing. The drag-and-drop editor is dense without being overwhelming. Users can use nine different content types in their emails, one of the most interesting of which is the video block. This is the only service we’ve seen that offers an easy way to add video thumbnails into an email. Email marketers hate having to screenshot a video, add a play button using Photoshop or some other design tool, upload that into the email marketing platform, add in an image block, add the image and then finally link the image to the video. It’s such a waste of time, and Mailigen has solved that with its video block. It’s a great move that makes the tool easy to use, especially with video content becoming so popular. 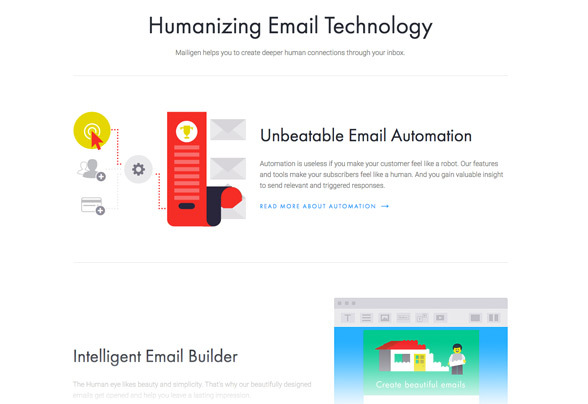 Apart from the usual features found in most email marketing platforms (automation, A/B testing, reporting and so on) and the video mentioned above, Mailigen does have a few features that make its professional-level plans more desirable, such as dynamic content, transactional emails, online surveys and SMS messaging. Combining all of these is where the true value of Mailigen is found. For example, if a company automatically delivered an online survey to people that bought its charity T-shirt and segmented those people into a “cared about this cause” list, it could SMS message them every time the company supports a new charity or display charity content and banners in its emails to that group with dynamic content. This is impressive, and it’s just one example. The opportunities are only limited by the user’s time and creativity. The more users put into Mailigen, the more it can give back. It is recommended to talk to Mailigen’s team to find creative ways to use the platform with a particular business.They’re happy to help. Mailigen’s customer support isn’t nearly as comprehensive as companies like ConstantContact, but when it is available, the service is prompt and thorough. It doesn’t offer 24/7 service, but during business hours, it offers phone, email and messaging support through Zendesk. Users can expect to hear back within an hour or two during normal M-F business hours. The forum support is good, offering over 100 different articles on topics such as web sign-up forms, email campaigns, SMS messaging, A/B testing campaigns and any other major feature it offers. For those seeking a bit more in-depth information, it has 20 e-books, white papers, and best practices guides that can help businesses get started with their email marketing strategy. Topics include list building via social media, six steps to better B2B marketing and SMS integration. Mailigen also has offices in six countries, which can be useful for international companies. Support is available via any of its offices. All the office numbers are posted directly on the website. Mailigen offers a complete email marketing solution with campaign sending, list segmentation, A/B testing, SMS integration, online surveys, transactional emails, marketing automation and much more. It isn’t the cheapest service, but the feature set makes it competitive, and the platform’s main selling point is its ease of use. Anyone can take off running with Mailigen. Digital businesses searching for a service that’s easy to use for simple email marketing moves, while still offering depth when it’s needed, should consider Mailigen. Founded by Janis Rose and Artus Bernovskis, Mailigen was originally a website development company that had a passion for new technology. Four web developers sitting around a table one day determined that website building wasn’t enough, and they decided to pursue building an email marketing service. 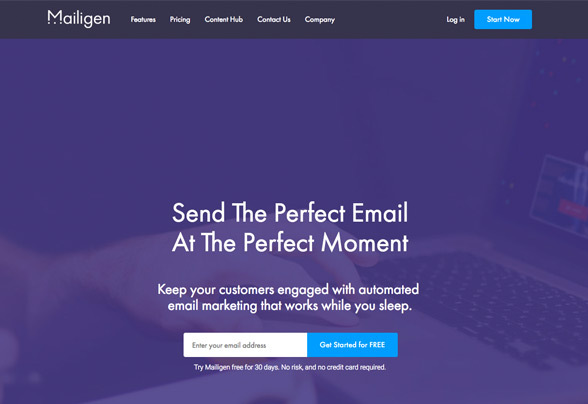 Mailigen strived to build a platform that felt human and focused on growing businesses through email storytelling. They now employ over 25 employees in six countries around the world: the United States, China, Latvia, Russia, Iran and Hong Kong.